The Missouri Department of Transportation has committed to some immediate maintenance efforts and to continuing design work so that, if and when funding becomes available, shoulders could be added to specific lettered highways in southwestern St. Charles County. At a meeting of the Missouri Highways and Transportation Commission in St. Charles on December 2, 2010, Kevin Keith, MoDOT’s Chief Engineer in Jefferson City, agreed to look at what improvements could be done immediately as maintenance work, and to begin to develop a plan for addressing the need for shoulders on Routes D, DD, F, N, Z and 94. 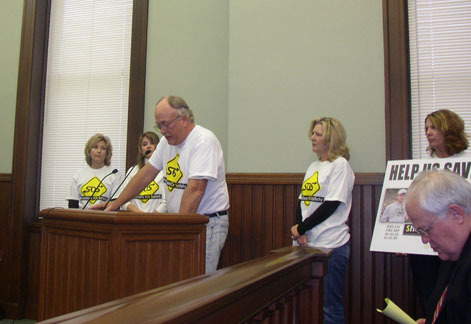 Over 25 people bearing SOS T-shirts attended the Dec. 2 meeting and three people from the group addressed the commission. In addition, St. Charles County Councilman Joe Brazil and County Executive, Steve Ehlmann, both spoke of the need for shoulders on those routes. After hearing the presentations, Keith stated he would meet with local maintenance supervisors and felt there were some things that could be done in the next 60-90 days. He mentioned that there are similar problems statewide, but commended the SOS group for identifying specific areas that needed attention and could be quantified; and for seeking out commitments for cost sharing from local businesses. On December 18, 2010, following up on Keith’s commitment, MoDOT Area Engineer, Jim Gremaud, provided SOS with a tentative plan for work on the two-lane lettered routes in this area. Gremaud asked the SOS group to review the plans and order of activity and let him know if they felt any of the priorities should be changed. SOS was scheduled to meet with MoDOT on Thursday, Jan. 7, 2010. Maintenance Projects: Beginning in early January, weather permitting, MoDOT will begin filling edge ruts and edge drop offs with aggregate (a crushed rock mixture) and cold asphalt millings. This work is NOT building shoulders. It is a maintenance effort. It will be accomplished by trucking material to the work site and putting it into a machine that will place the material along the pavement edge at select locations. MoDOT expects to have 10 or so trucks hauling material so the operation can move fairly quickly down the road. The materials used will come from stockpiles at various MoDOT locations which are typically used for this purpose. The work will continue as weather allows into February and possibly March. One lane of the lettered routes will be closed during these operations and flaggers will stop traffic and direct vehicles through the work area. Lanes will generally only be closed between 8:30 a.m. and 3 p.m. Tentative plans are to begin on Route D between Route 94 and Route Z. Once that work is complete, the plan is for crews to move to Route DD, then Route Z, Route N east of Route Z, Route 94 south to Route T, and then Route F.
Adding 3-4 feet of pavement to each side to MOST of the two lane roadways listed above and then overlay the entire roadway with new asphalt. This widening work will result in a 28 foot wide typical road section (2-12 foot wide driving lanes and 2-2 foot wide shoulders). In addition to the widening work MoDOT plans to reshape some steep slopes to something flatter, add rumble stripes along the center and edge lines of the road and install guardrails where necessary. The tentative schedule is to finish design work on Route D from Route 94 to Route DD and on Route DD from Frontier Middle School to Route D by the end of 2010; then focus on Route D out to Route F and on Route DD between Route D and Route 94. This design work should be complete by Spring 2011. If construction funding becomes available in 2010 or 2011 this is most likely how the construction projects would be prioritized as well. The order of completion is subject to change at this time. MoDOT has asked the SOS (Shoulders fOf Safety) group for feedback on the prioritizing and will take their suggestions under consideration. In addition, design work to add shoulders on Route 94 from South of Francis Howell High School to Defiance is almost complete. This design work was initiated almost a year ago due to possible stimulus money and the lower cost to make improvements in this area. The construction of this work could potentially begin shortly after any construction funding is identified, but again, a definitive schedule has not been established. These commitments from MoDOT can be largely attributed to the awareness raising efforts of the SOS (Shoulders fOf Safety) citizens group and support from St. Charles County government representatives. The SOS group organized a town hall meeting in New Melle on October 18 which featured a panel of state and local political representatives, officials from MoDOT and law enforcement agencies. Over 350 people attended and petitions bearing over 2400 signatures were presented to Senator Scott Rupp asking for support of funding for shoulders. On October 8, County Councilman Steve Ehlmann had requested that MoDOT move up the scheduled addition of shoulders on Hwy. DD from I-64 to Frontier middle school. In early November, MoDOT agreed to move up construction by about a year. That project will now begin in spring 2010 and be completed by year end. Since the October town hall meeting, SOS representatives have remained in regular contact with MoDOT officials as well as local, state and federal elected representatives, and have attended various public meetings handing out information and pleading their cause. Representatives from the group attended a meeting and later spoke informally with members of the East West Gateway Coordinating Council, which determines which state highway construction projects receive funding in the greater St. Louis region. The group has also garnered a commitment from Fred Weber, Inc. to provide some of the materials needed to help offset construction costs; and similar support is being sought from LaFarge, Inc. which operates the quarry on Hwy. DD. To help raise awareness, the group is selling T-shirts and car magnets to anyone interested in supporting their cause. SOS car magnets are available through January 11 at Double D Market at Highways D and DD, Defiance. The cost for the 9" x 12" car magnet is $5 each. The group is selling them at cost (no profit) just to give people an opportunity to be more involved and help spread awareness of their efforts. Drive, Suite 153, Lake St. Louis, MO 63367.